This map from the National Weather Service on Dec. 7, 2018, shows a wide range of weather warnings popping up ahead of a strengthening winter storm. American Airlines said it has proactively canceled 1,100 Sunday flights because of the storm. That is on top of 225 cancellations on Saturday. All flights to and from Charlotte on American's regional partners are canceled for Sunday, and more than two out of three of its other Charlotte flights are canceled. 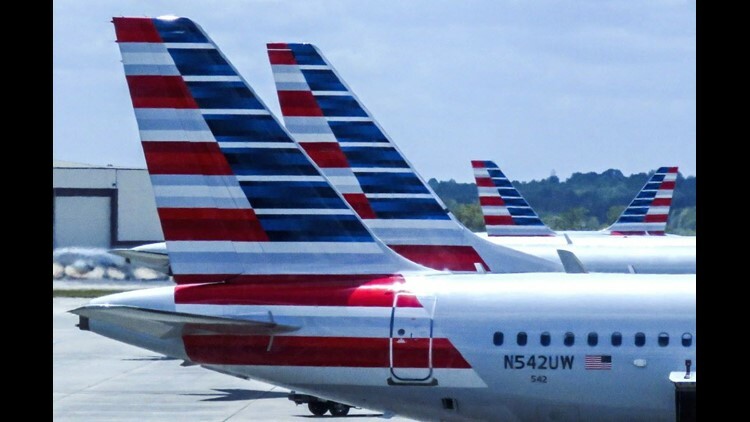 Since Charlotte is a major connecting hub for American, the cancellations also affect passengers headed to and from destinations not hit by the storms. Travelers who didn't change their flights are eligible for a refund if their flight is canceled, even if they have a nonrefundable ticket. The tail of an American Airlines Boeing 777 peeks out of a hangar at Dallas/Fort Worth International Airport on Oct. 14, 2016. Two American Airlines Boeing 757 tails pass one another at Chicago O'Hare International Airport in June 2015. An American Airlines Airbus A330 lands at London Heathrow in March 2016. Crews push an American Airlines Boeing 757 out of a gate at Chicago O'Hare International Airport on June 27, 2015. An American Airlines Boeing 777-200 takes off from Los Angeles International Airport in January 2015.
Business class aboard American Airlines' Boeing 777-300. The 777-300 joined the fleet in 2012. An American Eagle Bombardier CRJ-200 taxis to the gate at Phoenix Sky Harbor International Airport in May 2014. An American Airlines Airbus A321 jet lands at Phoenix Sky Harbor International Airport on Feb. 2, 2015. The old livery of American Airlines, seen on a retired MD-80 jet in Roswell, N.M., in August 2015. An American Eagle Embraer ERJ-145 regional jet takes off from Dallas/Fort Worth International Airport on Aug. 5, 2015. An American Eagle Bombardier CRJ-900 regional jet taxis toward the runway at Charlotte Douglas International Airport on Oct. 31, 2015. An American Eagle Bombardier Dash-8 turboprop waits for departure from Charlotte Douglas International Airport on Oct. 31, 2015. An American Eagle Embraer E170 jet passes in front of the iconic Hollywood sign while on final approach to Los Angeles International Airport on Nov. 8, 2015. An American Airlines Boeing 767-300 taxis to the gate after landing at Los Angeles International Airport in November 2015. An American Airlines Boeing 777-300 arrives at Los Angeles International Airport on Nov. 8, 2015. An American Airlines Boeing 757-200 lands at New York's JFK Airport on Jan. 16, 2016. An American Airlines Boeing 767-300 departs London Heathrow on March 6, 2016. A series of American Eagle tails dot the G concourse at Chicago O'Hare International Airport in April 2016. An American Airlines Boeing 787 'Dreamliner' lands at Chicago O'Hare International Airport on April 24, 2016. Surrounded by Delta Air Lines jets, an American Airlines Airbus A320 taxies out for departure on April 30, 2016 in Atlanta. An American Airlines Boeing 777-200 taxis to the gate after arriving to Frankfurt, Germany, on June 26, 2016. An American Airlines Airbus A319 lands at Seattle-Tacoma International Airport on Aug. 22, 2016. An American Airlines Boeing 737 takes off from Los Angeles International Airport in September 2016. An American Airlines Airbus A321 takes off from Los Angeles International Airport in September 2016. An American Airlines Boeing 787-8 Dreamliner lands in Los Angeles International Airport in September 2016. American Airlines' new premium economy cabin, seen on board its new Boeing 787-9 Dreamliner at Dallas/Fort Worth Airport on Oct. 14, 2016. American Airlines' economy cabin, seen on board its new Boeing 787-9 Dreamliner at Dallas/Fort Worth airport on Oct. 14, 2016. American Airlines' new Boeing 787-9 Dreamliner, seen at Dallas/Fort Worth airport on Oct. 14, 2016. An American Airlines Boeing 737 taxis into a gate at Dallas/Fort Worth International Airport on Oct. 14, 2016. American Airlines jets sit ready for departure from Dallas/Fort Worth International Airport on Oct. 14, 2016. An American Airlines MD-80 lands at Dallas/Fort Worth International Airport on Oct. 14, 2016. A welcome sign for Dallas/Fort Worth International Airport. DFW was American's busiest hub (by passengers) in 2015. The skyline of Charlotte. The Charlotte airport was American's second-busiest hub (by passengers) in 2015. A child walks through the airport in Miami. Miami International was American's third-busiest hub (by passengers) in 2015. The skyline of Chicago. Chicago's O'Hare airport was American's fourth-busiest hub (by passengers) in 2015. The skyline of Philadelphia. Philadelphia International Airport was American's fifth-busiest hub (by passengers) in 2015. A welcome sign for Los Angeles International Airport. LAX was American's seventh busiest hub (by passengers) in 2015. The skyline of New York. American counts its operations operations at JFK and LaGuardia airports as a combined hub, though JFK is the busier operation. JFK was American's eighth-busiest hub (by passengers) in 2015. LaGuardia was ninth. An American Airlines flight flies over the National Mall in Washington, D.C. The Washington Reagan National Airport was American's 10th busiest hub in 2015.